If you want to trace the history of fashion in the office, look at the way women’s outfits have changed over the years. Men do have a dress sense – and they can indulge in this on casual Fridays – but for them the suit has always been default work outfit. While you can see differences in men’s suits across the decades, in material and cut, there hasn’t been nearly as much variation as with women’s clothes. Fashion evolved far more distinctly for women as they ventured into the male-dominated world of work. Curiously, this also prompted a conversation about public health, but perhaps not in the way one would imagine. The late 19th century saw a huge increase in the number of women working in offices and administrative jobs, says a BBC article. In the early days many of these women were typewriter girls – doing the drudge working of copying documents and typing records. 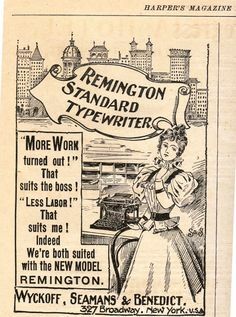 Clearly typewriter manufacturers sensed a new market and advertised directly to these women, saying their products could help them do more in less time. Many of the women drawn these adverts (a shade too early for photographs, remember?) are trussed up like turkeys, wearing corseted clothes that look like they’re from a Downton Abbey prequel, rather than an actual office. And there’s where the medicine men came in. Typewriters were seen as a potential health concern to users because they could end up giving people cramp – I suppose the modern equivalent would be Repetitive Strain Injury. However, corsets were seen as worse. I’ve found an article that suggests while some male opposition to the corset was because it actually highlighted a woman’s curves (cue much harrumphing and dropping of monocles), apparently they could affect one’s ability to breathe because of lowered lung capacity. Here there seems to be a confluence of concern and commerce, with an 1898 American journal reportedly saying that ‘no expert can manage either the typewriter or the bicycle while she is held in a close-fitting cage of whalebone and steel’. Lesson: if you want women to type fast and be productive, get them out of corsets. While women would take decades and decades to get out from behind the office typewriter, I think they saw the back of the corset a little more quickly. I’ve found a fantastic selection of photographs showing office fashion and women’s workwear from 1899 through to 1999. What’s striking is that, until about the 1960s, the uniform was a blouse and skirt. Of course there were variations in style and pattern – I’ve read that 1950s billowy skirts were fashionable because wartime restrictions on material were lifted – but it’s always a two-piece outfit, albeit sometimes paired with sweaters and cardigans. One of the main ways that women seemed able to exercise a bit of personal style and flair, to gently fight against regulations, was in how they wore their hair; in loose buns, falling to the shoulders, in braids or bobs and perms (the latter two seemed popular in the 20s and 30s). Personally I think office fashion gets interesting in the late 50s and onwards. Now women are still wearing skirts and blouses, but they’re also in Audrey Hepburn-style trousers and sweaters, moving into bolder colours and patterns, tapping into the prevalent counter-culture movement. Trouser suits and power-dressing were the style cues in the 70s and 80s (think Dallas and Dynasty). Yes, they were a way for women to feel more assertive in the office, but I suspect those big shoulders negatively affected their aerodynamic efficiency while striding to the boardroom. Swings and roundabouts. Or tennis at the country club. In many ways the 1990s saw two opposing trends – loose, colourful outfits and then camouflage, cargo pants and grunge. The latter did not translate so evidently into the office, though earthy and muted shades became more popular. And then came the dotcom boom and everything went more casual, which is how I think things have stayed. But we still care about fashion – 93% of people think how we dress influences people’s perceptions in the office. And only one in four of us do not plan our OOTD (outfit of the day). But I think we’d all agree that the real question is this: are corsets going to make a comeback? What Will You Read For World Book Day? What’s your sales power up song?